Upon cold start (ONLY if it has NOT been started for the day, even a cold start on the same day will not usually provide the same result! ), it will idle a little rough and I will need to give it some gas for a short time before the choke seems to "set". Only about a 5 second process, but it happens every time when I start it for the FIRST time that day. Afterwards, zero issues starting or idling upon cold start. 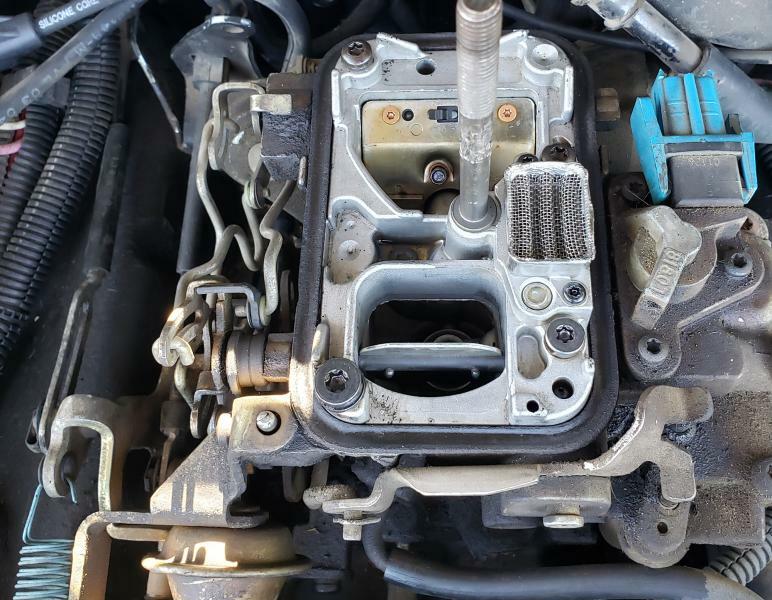 Main issue - The truck will idle and drive perfect, with no check engine light for a good 5-15 minutes while driving until it reaches operating temps. I will be sitting at a light and all of a sudden I will feel a miss and the check engine light will illuminate once the truck has warmed up. Light & miss happen at the exact same time, every time. Neither happen by themselves. This process will repeat itself indefinitely. If I start the truck very shortly after it has been driven (say getting gas, etc) it will miss and the light will illuminate. If it has been sitting for a few hours, it will be perfect until it warms up again. Drove it home, same EXACT problem as before with the missing and light. I disconnected the battery last night after the repairs and let it sit until today. Reconnected, and drove. Issue again was reproduced. Is there a way to adjust this sensor, or does it just need to be replaced? (Its cheap enough, not a big deal either way). ALSO, does this engine light and failure of the TPS correspond with the issues I am having, or is there something else? (MAP sensor, EGR, etc)? I was thinking if I cannot find any information I would just replaced ALL sensors/valves, as parts are extremely cheap and I have access to cheap labor. Man. I’m so sorry no one has responded to you yet. Apparently this truck is EFI since it has TPS and an ECM. Are you sure it’s an 85? Round gauges or the cluster that juts of the dash? If it’s in fact an 85 with a 2.8 it’s been retrofitted like mine. To me this sounds fuel related. I’m going through a strange situation with my truck too that is a retrofit EFI. I think mine is related to possibly having the wrong hoses connected and the BS with the externally mounted pump. Bout to find out. I’m replacing the tank, the pump module to stock and rerouting the lines correctly. Just throwing this out of your truck is a retro fit. May be in my boat. Hi, Yes, it is for sure an 85. I had someone check it out and they said both choke pull offs are bad, so I decided to order new ones. I'll put those on and see what happens from there. He stated the code might be a false positive because of the bad choke offs causing it to idle too high and dump too much fuel, reading it as a bad TPS. I'm just going off information I've been told in person, I know little to nothing about the 2.8 nor about carburetion or Pre-OBD II systems. There is a part they call the TPS though, and apparently it sits inside the carb which has to be removed to change it out. Do you have images of your retrofit? I'm curious to see what it looks like. Make sure the electric choke is opening all the way. Bad pull offs will make it rich when it's cold but they don't really do anything when hot unless the choke thermostat isn't opening. The tps code will set if the computer sees tps voltage out of range. You'll need to check it's output voltage with a digital voltmeter. This could be related to the choke not opening all the way but probably just a bad tps. So I might as well get a choke thermostat as well? If I need to remove the carb to change out the parts I figure I might as well just buy parts it probably needs and do it all in one big swoop, even if it ends up not needing the part, instead of continuing to troubleshoot. I suppose I'll wait until I get my pull offs, see if any impact is made, if not, buy the thermostat and put the TPS I already purchased in. You only have to pull the top off to change the tps but you will need a new gasket that if i remember right is only available in a carb kit. At that point you should probably pull the whole thing off and replace all the gaskets. If the choke thermostat is working I'd leave it alone. Its riveted and its kind of a pain to replace unless someone already has. So would I check to see if it is working properly by checking it on a cold engine, then seeing how it is after it has been warmed up (no change to the choke = faulty)? Sorry for sounding ignorant, I'm a youngin' born when fuel injection was becoming popular. The choke blade should be fully closed after pumping once when cold. Immediately after it fires up the pull off should open the blade about 25%. After about 10 minutes the thermostat should fully open the blade. I just tried it out today. Looks like it is doing exactly what you stated it should. Opened up about 25% or so once I started her up. It was smoking black and hesitating a little bit, but actually didn't die by itself today. Once it warmed up it opened fully (pic included). Is this hesitation because of the pull-offs, if the choke is working correctly? 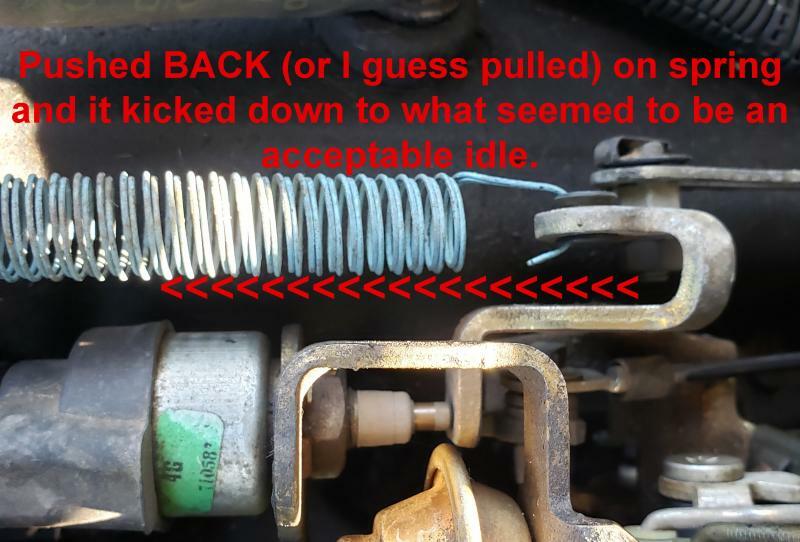 One thing I did notice, however, was it seemed to be idling really high, and I pushed back on the throttle/spring and it kicked down to what seemed to be the appropriate level. Wondering if this has to do with the possible faulty TPS?